On the heels of LGBT Pride Month comes Houston’s own QFest. Entering its 21st year, QFest is dedicated to promoting the arts that are by, about, and of interest to the gay, lesbian, bisexual, transgender and queer community, and this year has a wide range of films that reflect this mission. The festival runs from July 27 – 31 and has partnered with the Museum of Fine Arts, Houston, Aurora Picture Show, and Rice Cinema, to name but a few, as venues for screenings. Each year the festival grows larger and stronger, so I talked to Kristian Salinas, the festival’s Artistic Director, about two of this year’s films that have strong literary ties: Maurice (playing Sunday, July 30, 5 pm at the MFAH), which is based on E.M. Forster’s book of the same title, and Bones of Contention (playing Saturday, July 29, 5:15 pm at Rice Media Center), which centers on Spain’s most famous poet, Federico García Lorca. For tickets and more information click here. We all know about the pig’s blood. Carrie was a game-changer not only for horror and teenage revenge fantasy movies, but also for the careers of Stephen King and director Brian De Palma. 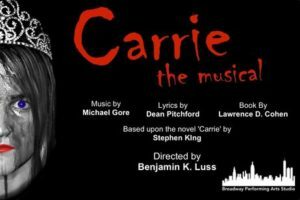 On July 21st and 22nd, however, Broadway Performing Arts Studio will put on a production of the ’88 Broadway hit Carrie: The Musical at MATCH theatre , which, in my opinion, begs a number of questions, so I contacted director Benjamin Luss.